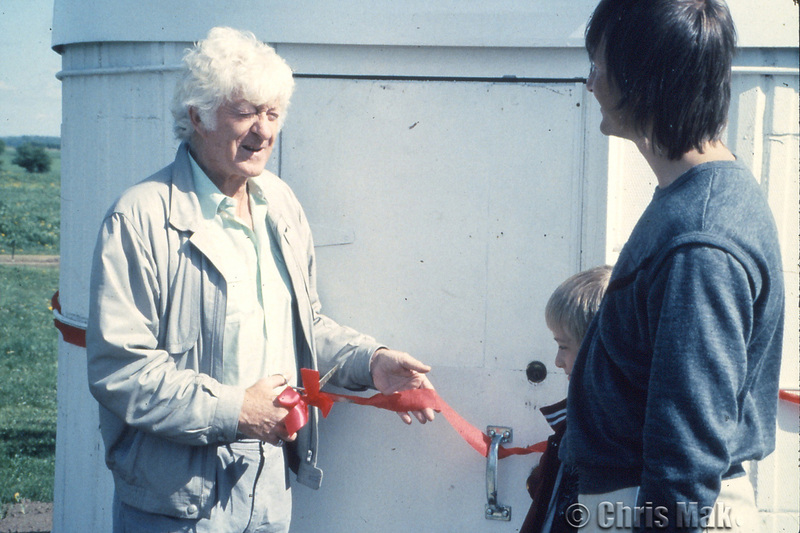 Jon Pertwee cut the ribbon at the the RASC Kitchener-Waterloo Centre's Dance Hill Observatory near Ayr, Ontario on the weekend of May 25, 1985. The Doctor Who actor was in the K-W area for a convention (Who Party 7) put on by the Doctor Who Information Network. These slides were taken by Kevin Schlueter and uploaded by Christine Mak. Dance Hill Observatory was recently decommissioned and added to CP Rail property. These photos appear with the permission of Steve Holmes, RASC K-W Centre president.